Hunting the elusive wild turkey during the spring or fall turkey season requires a plethora of gear. Even when hunting from a blind, you’re juggling calls, a seat cushion, shotgun or crossbow, shells, water, snacks, and other stuff while stalking birds out in the field. It seems this gear problem is common among turkey hunters, which is why some smart hunters came up with the turkey hunting vest. Turley vests are great for hunters who need to easy access to multiple calls, with additional pockets for more gear. The best turkey vests even feature built-in padded seats and hydration pack slots for the most mobile turkey hunters. But which are the best turkey vests for the money? Like any piece of hunting gear, there are many similar looking vests but differ greatly in price and quality. Check out the reviews below. Has Tons of Pockets – Because you can never have enough pockets when turkey hunting. Between all your gear, snacks, bullets or shotgun shells, calls, and other items, your pockets are usually overflowing with stuff. More pockets to organize your kit is usually better. Best Materials – A good vest must be lightweight and comfortable to wear all day. This requires quality wind and water-resistant materials that don’t rip, and have great camo patterns. Hydration Pack Compatibility – For those hunters who move frequently and cover a lot of ground, having the option of a built-in hydration pack makes your work easier. Padded Seat – A padded seat might seem gimmicky, but they are actually very handy. They are always built into the backside of the vest and simply flip down when you’re ready to stake out a spot. Kickstands/Backrests – Built in kickstands and backrests take the load off your back when crouching low in the brush. Even if you find them to get in the way, they are usually removable. Game Bag – A built-in attachable/detachable game bag makes for one less thing to forget. It’s not necessary but can really come in clutch when you most need it. Before you choose your vest, it’s important to know what style of turkey hunting you intend on doing. Are you hunting from a blind? Or are you running and gunning? Maybe you do a little of both. Each type of hunting has its own set of challenges. If you’re hunting from a blind, chances are you don’t need to carry everything with you. You probably have a seat already, and you don’t need to carry a hydration pack because you have brought enough water with you in the blind. But you are going to want places for all your callers and other things you like to keep on you. If you stalk your turkeys, chances are you need to bring all your kit with you. That means you’ll need more pockets for gear, a water bladder to keep you hydrated, and a way to have a seat with a supportive backrest. Whether you’re a minimalist, or whether you like to bring everything you think you’ll need (or somewhere in between), you need to take this into account when choosing a turkey vest. You’re going to want a vest that will work for you and your style of hunting, regardless of whether the vest has the latest nifty do-dads on it. The following is our ananlysis of the best turkey vests of the year, including adavantages and drawbacks of each model. Tons of gear pockets, with game bag, and hydration pack support. Removable metal frame to support your back. Most versatile turkey vest on the market. Heavier at 6.88 lbs/ 7.13 lbs with frame and 4.38 lbs/ 4.63 lbs without frame. Game bag and seat cushion attach with magnets, and can occasionally pull loose. High-end features command a higher price. When it comes to features on a turkey vest, the Alps OutdoorZ Grand Slam is hard to beat. It seems they thought of everything when they created this vest, and the weight seems to prove it. Although its stand adds the weight of an extra rifle even before you pack all your gear into it, it offers tremendous back support when you’re running and gunning and need to rest. Don’t like the extra weight? You can go lightweight by shedding the frame. Incredibly versatile and made from tough materials. Lightest turkey vest on the market at under 2 lbs. Highly adjustable to fit men, women, and some youth. Quality cushioned seat and hydration pack ready. No game bag; must sling over your shoulder and tie to the vest. Little back support, not intended for long sits in blinds. The Knight & Hale – Run & Gun Vest is the lightest weight vest on the market at less than 2 pounds. It is adjustable with a 10 point adjustment system that will allow you to personalize your fit for the best mobility and comfort. This makes the Run & Gun vest ideal not only for men but for women and older youth. The downsides of this are that there is no game bag, which makes carrying a gobbler somewhat problematic. Although its cushion is comfortable enough, it isn’t intended for extra long sitting. No support for a hydration pack, no game bag. Some found the fit to be oversized, even when adjusted. The Beard Buster Deluxe Turkey Vest is a lower cost solution to the turkey vest problem. People who buy them love the price and the versatility, and at least one person said they’d use it for deer hunting as well. Many people noted that the value of this vest was equal to many turkey vests that cost much more. The 2-inch thick seat is waterproof and keeps you dry and off the ground. A negative is that it doesn’t support a water bladder, which means you’ll have to have a separate hydration pack. Lightweight and modular, with padded waist belt and a removable lumbar pack. Removable shoulder harness and game bag. No seat or support for a hydration pack. Better used in a blind. The Alps Long Spur Pack is a lightweight, modular pack that enables you to adjust it for your needs in the field. Roomy pockets and a removable lumbar pack makes this a winner for those looking for high versatility when it comes to adjusting their packs. Drawbacks include no support for a water bladder and no seat, but if you’re planning on hunting in a blind, that’s not a problem. It’s also adjustable, so you’re not going to get a flappy vest. One person did complain that after three hunts, a zipper to the rear compartment broke and the locator call pocket ripped. Enough room in the back to carry a bird. The seat is thin and can only be used for an hour. Harder to deploy the seat when the vest is adjusted snug to the body. Pockets are not totally waterproof. The Alps Impact Turkey Vest has a built-in “chair” that folds out when you need to sit down. Hunters told us that for how simple and lightweight the design was, it was amazingly comfortable. Even so, the padding in the chair is minimal compared to other vests and sitting longer than an hour might prove uncomfortable. There is a pocket in the back that could serve as a pocket to hold a hydration pack. Its removable front pocket is designed for run and gun hunts. Best youth turkey vest sized for children between ages 6 and 14. Easily adjustable with age, built in blaze orange safety flag. Not as many features as an adult harness. Seat padding is relatively thin. If you’re looking for a high-quality youth turkey vest, the Lucky Bums Youth Turkey Vest may be your answer. Made to fit youths between 6 and 14, it’s an ideal vest for the young hunter. Made primarily for boys, it states it has an adjustable padded shoulder and sternum strap. It has a detachable orange safety flag on the back. Highly adjustable and lightweight at just 3 lbs. Plenty of gear pockets, and has a turkey compartment. Some find the sizing to run large, even with all the adjustments. The Tenzing TZ TV18 is made from quality materials and has a number of very good features like ample pockets and a very comfortable seat. That being said, it has little back support and no support for a water bladder. It does have a compartment to put your turkey, but it does not have a detachable game bag. Some hunters complained that the vest was too big for them, even when adjusted. 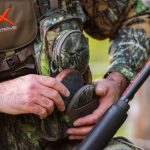 Calls – Most of the front pockets are designed to hold the myriad types of turkey calls, most commonly pot calls, box call, and diaphragm calls. Tools – LED headlamp for early morning prep and late evening returns, hunting knife, pruning shears or folding saw to trim branches, and a multi-tool for on the spot repairs of gear. Insect Repellent – Nothing is worse than sitting in a thicket swarmed by mosquitos, flies, and gnats. Some turkey vests have side and back pockets designed to hold a Thermacell unit, which will help keep the critters away. Personal Items – Medication, wet wipes or toilet paper (when nature calls), snacks like beef jerky, nuts, energy bars, and trail mix. Decoys and Spare Stakes – Carrying a portable decoy along with extra spare stakes will greatly improve your chances of finding a gobbler.